Good news from the popular voting front. It appears that McCain’s march to tighten the popular vote has stalled out over the last few days. Obama picked up .1% and McCain dropped .1% since yesterday. For five days, McCain’s support has remained between 44.3-44.4%. Unless the polls are incorrect, it looks like McCain’s ceiling may have been slightly lower than the 46% we saw back in September. The bottom line is that Obama’s support has been solid above the 50% line. This is great news as it guarantees a popular vote win (providing the numbers hold), regardless how the late independents break. I tend to think they will break for McCain, but it won’t be in the 75% range. Also remember, that this is a two person horse race in most polls. Add Barr and Nader and I think you will see a net -1% for McCain. McCain now has to make up over 2% per day to capture the popular vote lead. That looks very unlikely. We finally see some movement in the Electoral College numbers. Obama’s lost 4 more EV’s and that’s a total of 9 since last week. This has been soley the result of a gradual move from each pollster of Indiana from Obama to McCain. For the last week I’ve warned we’d probably see Obama finish in the 330’s-340’s for the final poll on Monday. 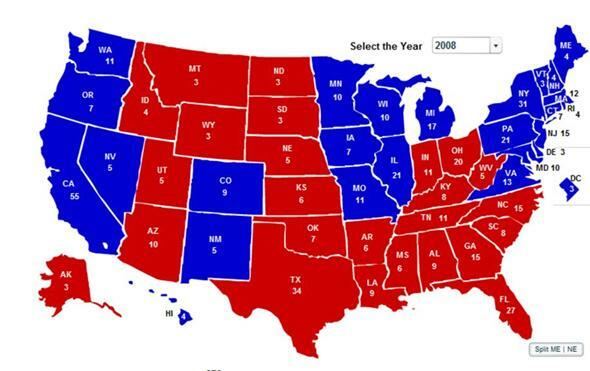 I still think that will happen based on where Missouri and North Carolina end up (a total of 26 electoral votes). Regardless, everything remains stable. The polls don’t appear tightening to any significant degree. Pennsylvania remains solid. Colorado and Nevada have strengthened for Obama. Virginia also remains steady. Obama is also now looking at outside chances of picking up Montana, North Dakota and perhaps Arizona. The bigger news is that McCain hasn’t pressured any states that Obama ‘needs’ to win back into a tight race. As my previous post has indicated, if you believe the polls (and I do) then this race is essentially over. I think even if there was an October surprise, it would be difficult to have McCain come back (depending on what the surprise was). The only type of surprise that probably could cost Obama the election is one that directly implicates him in something nefarious or awful. Looking at how the Bin Laden tape of 2004 and the drunk driving arrest affected the last two races, it probably moved the race only a 1-2%. That would still give Obama a comfortable lead. The race for the popular vote has some what steadied out now. McCain was down .1% and Obama was even. This is the fourth straight day where McCain has been between 43.3% and 43.4%. Not much movement. He’s got four campaigning days left, which means he needs to gain 1.5% every day. But looking over the 19 days the poll has reported, Obama is down .2% and McCain up .6% – a net of less than 1%. Looking at the polls today, they were flat to slightly leaning toward Obama. That’s a good sign. Some of the Poll of Polls has Obama above 50%, some right below 50%. That threshold is important as it wouldn’t matter how the undecideds broke – particularly with his lead in the Electoral College. I suspect the polls will point up slightly for Obama tomorrow, based on his Obama-on-the-air-all-the-time technique he’s been employing. I do caution, I believe there is probably another 2% of McCain support that will ‘come home’ to him prior to the election. I also believe Obama will stay at about 50%. The one question – why can’t McCain gain back that 2%? I think there is an aspect to the McCain support that hasn’t been analyzed yet and maybe influencing why he can’t get above 45%. Very bizarre night. I couldn’t get my polling numbers until after midnight, then my computer lost my data file, and the editor for the blog is acting funky. Anyway, on to the analysis. This was Obama’s third worst polling day and tied for his worst day-over-day drop (.7%). On the surface it looks like there isn’t a lot of good news for Obama. Any good news, probably not? But, the ‘ok’ news is two fold. First, this is the third day in a row where McCain’s support has been flat. That is never a good sign when you are trying to make up ground with so few days left. Second, Obama’s drop did not correlate with a McCain gain. What does that mean? It means Obama lost some support but it wasn’t picked up by McCain. These voters are still considering Obama and may constitute some of his ‘soft’ support – similar to what we’ve talked about with McCain. He is still .2% above his lowest number over the last 17 days. McCain now has five campaigning days left to gain 6 points. That’s 1.2% per day. Since the polls started tightening over the weekend, he’s only gained about .36% per day. If there is closing, though, this rate will probably accelerate as undecideds start making their decision. But still, 1% each day may be tough. Additionally, these trackers are either 3 or 5 days worth of polling. Which means each day is worth about 1/3 of the poll numbers. Most polls were flat today and some of Obama’s strongest numbers from early in the weekend have dropped off. What that means is that we’ll probably see no change in the polls tomorrow or a slight uptick for Obama – I’ll leave all the math reasoning out, for now. If that premise is right, McCain will have not made an impact for yet another day. The Electoral College tells a whole different story. We *still* see no tightening in the state polls. I have professed the ‘lag’ theory in state polling, which means it takes some times for national poll tightening to occur at the state level. That has changed a bit as we reach the final stretch of the election. There were 45 new state polls out today. This is different from a couple of weeks ago when there might be 4-5 per day. Polling is much more real-time now. The point? Have confidence that the race is about where the Electoral College says it currently stands. As my graph shows, it really hasn’t changed in 17 days. I still maintain you will see a drop to the 340’s sometime in the next few days. I believe North Carolina and Missouri will probably drop out of Obama’s column. Looking at the individual state polls, the news is nearly all good for Obama. He is growing his leads in Colorado, New Mexico, and Nevada. He seems to be growing a decent lead in Ohio and gaining more ground in Florida. Pennsylvania’s new polls shows double digit leads for Obama. Virginia continues to remain a solid high single digit lead for Obama. So how can the national polls differ from the story in the Electoral College? Well, the most common theory is that the red states are getting more red. Obama’s support is enthusiastic and strong. He is already over 50% and his base is strongly with him and planning to vote. McCain is reacquiring his ‘soft’ support. Much of this is in ‘red’ states. I suspect if you had polls out in Texas, Utah, and Oklahoma, you’d see his leads getting stronger. Somewhat offsetting that is Obama’s small, but improving, positive position in key battleground states. That’s why Obama’s numbers remain stable, while McCain’s improve. 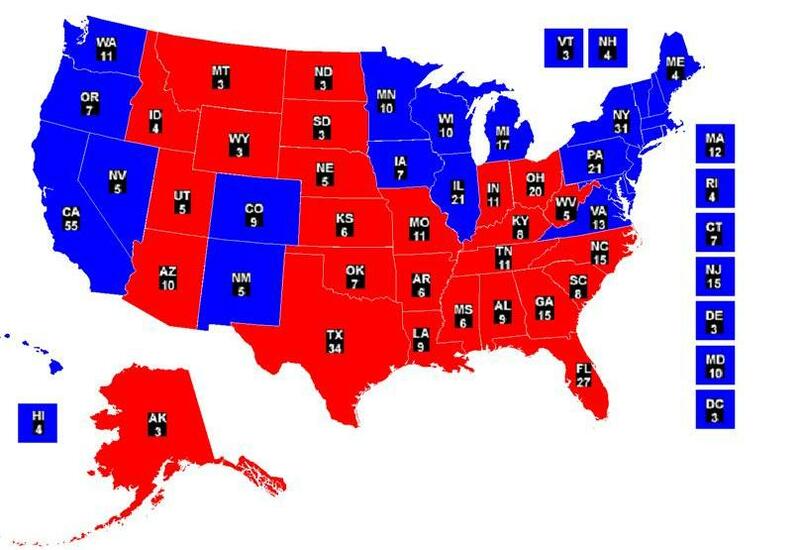 Here’s the warm fuzzy picture: Obama will win all Kerry states – 253 Electoral Votes. He will also pick-up Iowa – 260 Electoral Votes. At that point, he needs ten more. He can take Virginia, where leads about 7. He can take a combination of (two of three) Colorado, Nevada, and New Mexico – where he leads all by about 7 points. He can take Ohio where he leads by about 6 or Florida where he leads about 4. He could also still take Missouri or Indiana – both basically toss-ups. Or, he can come from slightly behind in North Carolina. The moral of the story is that if he holds Pennsylvania (which is about a ten point lead), he will win. I am just not sure how McCain can come back in the Electoral College in five days. However, it is politics and anything can happen. Finally, if there is any ‘bump’ (and I think there will be one) from tonight’s Obamamercial, we won’t see any real effects until Friday and won’t fully be in the numbers until Sunday.